NEW YORK—As the Broadway revival of the one-person show “Fully Committed” makes clear, it’s the tiny cogs in a machine that keep everything turning. Or, to put it in human terms, it’s people such as secretaries, mailroom workers, and hotel wait staff who prevent mistakes that might otherwise reverberate up the chain of command and cause a breakdown in the system. These folks rarely get enough credit for doing so. 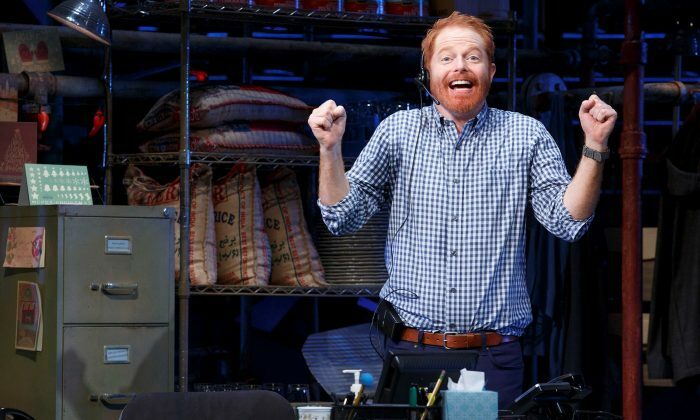 One such person is Sam (Jesse Tyler Ferguson), a wannabe actor. He works in the cramped, windowless basement of a super trendy New York restaurant and takes calls from a myriad of potential diners begging, demanding, and cajoling for a table—despite the fact that, in terms of reservations, the place is continually fully committed. The show is a literal tour de force for Ferguson. It’s a particularly bad day for Sam. His co-worker Bob, with whom he shares the reservation responsibilities, is nowhere to be found. A television project, which was all but a done deal, has fallen through. He’s still in the recovery phase of a very painful breakup, and he’s not sure if he’s going to be able to get home for Christmas, the first for his family since his mom passed away. Trapped with a seemingly endless bank of ringing phones, unable to get away for lunch or to even use the bathroom, Sam is trapped. All he can do is deal with one call after another and try to placate each to the best of his ability. One caller is the editor from Bon Appétit magazine, who wants to know why the chef has been keeping her photographer waiting for hours. Another is a senior citizen who doesn’t understand why the restaurant doesn’t honor a specific discount. Then there’s a guy who wants the staff to sing “Lady and the Tramp” to his parents, who will be celebrating their wedding anniversary at the restaurant that night. There’s also an issue with actress Gwyneth Paltrow, who insists on having a vegan tasting menu available, and who also wants the restaurant lighting near her table changed, as it was too harsh the last time. The show takes potshots at the world’s powerful elites and how those below their stratosphere jump through hoops in order to make them happy. It also shows how those lower in the food chain (no pun intended) also throw their weight around from time to time. Paltrow’s assistant, Bryce, is an example of this behavior as he continually yells at his own subordinates. Even Sam finds himself feeling forced to play the “wronged customer” card with an unsuspecting helicopter company to cover up his own mistake of forgetting to book the chef’s travel reservations. Although two wrongs don’t make a right, by the time Sam goes into his act, the audience has so identified with his put-upon state that we are totally rooting for him to eek out whatever victories he can. The show take potshots at the world’s powerful elites. Also in for a ribbing is the world of acting in general, which we see through calls with Sam’s friend Jerry. Jerry seems to be further along in his acting career than Sam at the moment. Sam has problems trying to get his agent to take his calls. In the theater, as in most businesses, connections can be everything. Thus the importance of not upsetting those individuals you may not like at the moment is stressed. You never know just when they might be able to help you. The show is a literal tour de force for Ferguson. The actor embodies over 40 characters, making each totally identifiable and distinct. More than simply changing his vocal inflections for the different personas, Ferguson is able to literally become the people presented through physical movements, gestures, and facial expressions. One of the funniest moments in that regard occurs when Sam is trying to describe the menu—the restaurant specializing in molecular gastronomy—to a doctor’s receptionist from Wisconsin. Her bewilderment and incredulity increases by the moment as Sam explains some of the different items and prices. Kudos goes to Derek McLane’s set. The area has the cramped, tight feeling of a place where a perennially underappreciated worker is forced to toil. Also very good is Jason Moore’s direction, which never allows Ferguson to take his characterizations too far over the top. Indeed, in some cases, he makes them feel quite real and familiar. Probably the most satisfying thing about “Fully Committed” is that it shows how, just as in life, you win some battles and lose others each and every day. If you’re lucky, however, you’re able to chalk up enough in the “win” column to prepare yourself to come back and do the same thing again tomorrow. Thanks to a very strong performance and excellent production values all around, this is one completely fulfilling and satisfying experience.